PEN offered it’s last Speaker event of this season on Friday, May 14, 2010. A panel of high school learning specialists shared their experiences of working with high school students who have learning and attention challenges. The panelists and the institutions they represented were: Susan Coe Adams, Marin Academy; Constance Clark, Immaculate Conception Academy: Karen Houck, Drew School: Denise Olivera, Gateway High School and Charles P. Roth, Bay School of San Francisco. This is a summary of their points of view. This discussion focused primarily on Grade Nine, though there were references to high school students in general. All of the schools are college preparatory. Admission: Some schools require documentation on the prospective students learning or attention challenges. One school distills the documentation and develops a learning profile on challenged children. They have the student confirm the information on the learning profile and then the student takes it to his or her teachers as part of a self-advocacy program. Some schools have workshops on study skills, how the brain works and time management at the beginning of Grade Nine to help the students integrate into high school. Parents when interviewing a school would be best served by first checking the school’s website to see if the profile of the school fits their child. Go to admission open houses and be sure to visit the resource center. At the interview these are some questions that might be asked. a: what services are offered including information on a resource program. b. what are the qualifications of the resource program staff. c. how do teachers teach: lecture, visual aids etc. d. how is the child assessed: projects, homework, tests. e. How many students have learning issues? f. Can a student have a waiver for a subject? g. how many students leave because of their learning difference. h. Ask for contact information of parents who have kids with similar issues. Be sure to make a list of your questions and give them to the admissions director. Most of the panelists felt that students with ADD or ADHD would be best served if they were given psychological testing. In similar kind, most of the panelists felt that a dyslexic student and their teachers would benefit from the information gained from an Educational Therapist. Some schools have programs where Grade 12 learning or attention challenged students support the incoming Grade Nine students with like situations. This program seems very supportive especially for those Grade Nine students who more recently learned about their challenge and are embarrassed by it. Peer support seems effective. Grade 12 students also mentor in chemistry and writing. Learning how to plan and organizing material is often top on the agenda. Learning specialists help students become advocates for themselves. Some schools run training programs for this purpose. All of the panelist’s schools have homework which can vary from 2-3 hours for students with no learning or attention challenges. This can mean almost double the time for the challenged students. Learning specialists need to re-inforce with the student that they will have to work harder. Some parents choose to have tutors help with homework. Others look to Books on Tape. Parents and their kids need to plan how homework will be accomplished. Some parents use bench marks. Most schools post homework on-line. Yes, they are useful tools. Parents need to control their use at home so that homework time is strictly homework. One solution offered was having the student in the kitchen doing homework. One person in the school needs to become the central connection with parents. Information can be garnered from the Resource Specialist overseeing each grade level, sometimes a care team. Other sources are E-mail,weekly meeting of faculty to discuss students who are facing problems. One advisor has each of his challenged students send an e-mail once a week to his teachers checking if he is up to date with all his assignments. 4. Most panelists seemed to agree that it is not realistic for a school to provide the following for learning and attention students: modification of the curriculum, tutors, direct services, therapy, daily communication with parents about homework. Remember: these schools are all college preparatory. Challenges learning and attention students need to master during high school so they can be successful. a. Executive functions: planning and organizing material, handling effectively a daytimer. highlighting b. making transitions, c. finding ways to deal with dense text books, d. self advocacy, e. how to approach long projects. 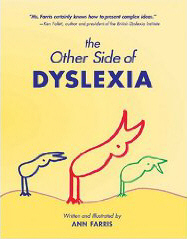 Comment: If I were a parent with a child who has recently discovered he or she is dyslexic I would be both grateful for this panel discussion and perhaps overwhelmed at the task before both the child and the parent. What she did with a reading disability. For years, Ann Farris of San Francisco, California, tried keeping a secret hidden: she wasn’t particularly gifted in comprehending what she read. Eventually, Farris learned she had a learning disability in reading comprehension. Yet she has succeeded in her chosen profession. She worked in musical theater from ages 18-24 before entering the world of opera. Her first big break came as the production manager for the 1967 World’s Fair in Montreal, and while there worked with the Bolshoi Opera, Hamburg State Opera, and Royal Swedish Opera, among others. Later, she was on staff with the San Francisco Opera and managed Opera America, the international service organization of professional opera companies. Ultimately, she became program director of the Opera-Musical Theater Program of the National Endowment for the Arts, and produced the Expo 86 Royal Bank World Festival. How? In college, she had “hung out” with people who talked all the time about what they were reading for classes. She listened intently, and listened to class lecturers. And she had learned from an early age to write everything down she heard. Five years ago, she tested at a grade 3 reading comprehension level, but claims to have improved that to grade 9 using certain imaging techniques. “The reason I couldn’t comprehend was because I wasn’t imaging,” she said. You can learn more about her personal story at dyslexiadiscovery.com. Blue Valley Sod and All American Foods made this column possible. Mr. Vance asks two things if newpaper editors are planning to publish this article. Please notify him Weekly_Disabilities_Column-owner@yahoogroups.com and that you publish the TAG LINE mentioning the above listed sponsors.